The postmodern turn underlies a new development in psychoanalysis, which has theoretical and practical implications. Psychoanalysis, Apathy, and the Postmodern Patient involves a detailed reading of the main psychoanalytic texts that mark out this extended development, along with a critical examination of the changes in the major Freudian concepts. At stake are the tenets of infantile sexuality, ‘psychic reality,’ unconscious determinism, the fulfilment of unconscious desire, and free association. 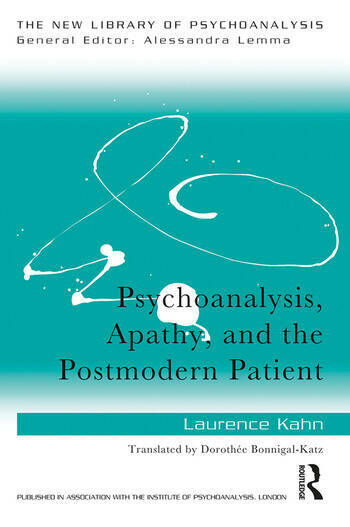 In this book, Laurence Kahn sets out a critique of postmodern psychoanalysis, via a theoretical and clinical discussion that tackles the place of metapsychology and the question of the scientific status of psychoanalysis. Starting from Freud’s own work, she considers such key topics as the analyst’s objectivity, the relevance of self-disclosure, the complex influence of French postmodern theorists, and the role of empathy in psychoanalytic technique. In so doing, she offers a perspective on psychoanalytic thought and practice that exposes the insidious taming of the Freudian model in favour of a 'humanistic' and 'dialogic' approach that obliterates the radical otherness of the unconscious. Coming from a powerful voice in the contemporary French psychoanalytic tradition, Psychoanalysis, Apathy, and the Postmodern Patient is a bold celebration of psychoanalysis that will be of great interest to psychoanalysts and psychoanalytic psychotherapists, as well as philosophers and historians of thought. Chapter 5: Empathy: a new common ground? Laurence Kahn is a Training Analyst at the French Psychoanalytic Association (APF) in Paris and held the function of President of the APF from 2008 to 2010. She was previously co-editor of the Nouvelle Revue de Psychanalyse and editor in chief of L'Annuel de l’APF.